The real-time scanner (aka 'On-Access Scan') is always ON and checks files in real time when they are created, opened or copied (as soon as you interact with a file, Comodo Antivirus checks it). This instant detection of viruses assures you, the user, that your system is perpetually monitored for malware and enjoys the highest level of protection. The real-time Scanner also scans system memory on start. If you launch a program or file which creates destructive anomalies, then the scanner blocks it and alerts you immediately. Should you wish, however, you can specify that CIS does not show you alerts if viruses are found but automatically deals with them (choice of auto-quarantine or auto-block/delete).It is highly recommended that leave the Real Time Scanner enabled to ensure your system remains continually free of infection. Note: The above two settings can be modified from the 'Advanced View' of the Home screen by clicking the status link beside Antivirus. 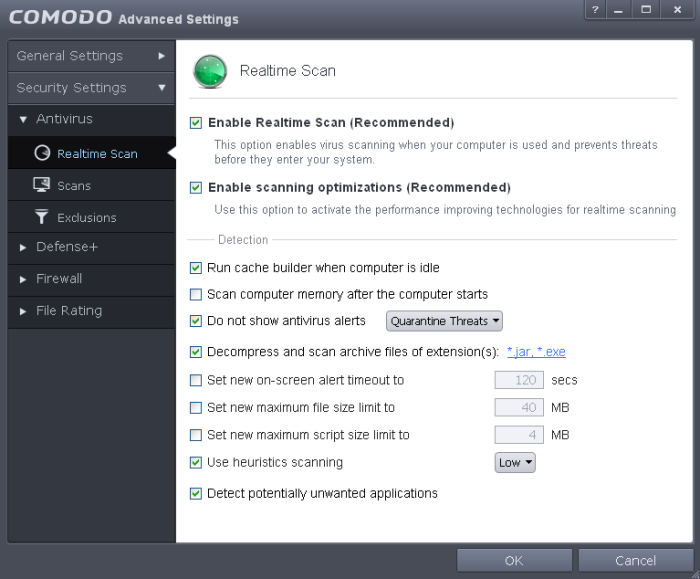 If you choose Disabled option, both 'Enable Realtime Scan' and 'Enable scanning optimizations' will be disabled. If you choose 'Stateful', both the settings will be enabled and on choosing 'On Access', only 'Enable Realtime Scan' will be enabled. Run cache builder when computer is idle - CIS runs the Antivirus Cache Builder when the computer is idle, to boost the real-time scanning. If you do not want the Cache Builder to run, deselect this option (Default = Enabled). Block Threats – Stops the application or file from execution, if a threat is detected in it. Note: If you deselect this option and thus enable alerts then your choice of quarantine/block is presented within the alert itself. You can add the archive file types that should be decompressed and scanned by Comodo Antivirus. Click link on the file type displayed at the right end. 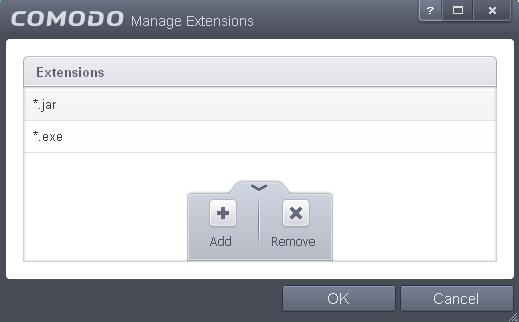 The 'Manage Extensions' dialog will open. To add a file type, click the up arrow at the bottom center and click 'Add'. Heuristic techniques identify previously unknown viruses and Trojans. 'Heuristics' describes the method of analyzing the code of a file to ascertain whether it contains code typical of a virus. If it is found to do so then the application deletes the file or recommends it for quarantine. Heuristics is about detecting virus-like behavior or attributes rather than looking for a precise virus signature that matches a signature on the virus blacklist. This is a quantum leap in the battle against malicious scripts and programs as it allows the engine to 'predict' the existence of new viruses - even if it is not contained in the current virus database. Medium - Detects unknown threats with greater sensitivity than the 'Low' setting but with a corresponding rise in the possibility of false positives. High- Highest sensitivity to detecting unknown threats but this also raises the possibility of more false positives too. Detect potentially unwanted applications - When this check box is selected, Antivirus scans also scans for applications that (i) a user may or may not be aware is installed on their computer and (ii) may functionality and objectives that are not clear to the user. Example PUA's include adware and browser toolbars. PUA's are often installed as an additional extra when the user is installing an unrelated piece of software. Unlike malware, many PUA's are 'legitimate' pieces of software with their own EULA agreements. However, the 'true' functionality of the software might not have been made clear to the end-user at the time of installation. For example, a browser toolbar may also contain code that tracks a user's activity on the Internet.